Cowger Site: From Moscow, take Highway 95 South to Lewiston. After crossing the bridge over the Clearwater River. Turn left onto E. Main (before the light). Take a right on Lindsay Creek Road. Pass Gun Club Road and take the next right onto Larch Lane. The restoration site is located on the property owned by the Cowger family, there is a large parking area near the creek by the shop. Walton Site: From Moscow, take Highway 95 South to Lewiston. After crossing the bridge over the Clearwater River. Turn left onto E. Main (before the light). Take a right on Lindsay Creek Road. Take right on Gun Club Road. The restoration site is located on the right and is located on the property owned by the Walton family. There are a few pull outs along Gun Club Road or parking is available on the Cowger Site across the street (see above directions). Neilson Site: From Moscow, take Highway 95 South to Lewiston. After crossing the bridge over the Clearwater River. Turn left onto E. Main (before the light). Take a right on Lindsay Creek Road. Continue up Lindsay Creek Road for approximately 2 miles. Restoration site is located on the right about 1/2 mile past the turn off toward Lapwai Road on the left. Take right on to (4494) Hamilton Lane. 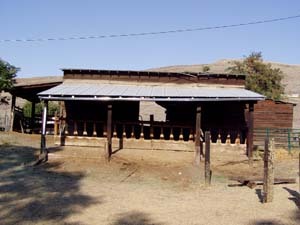 Property is owned by the Neilson family. Parking is available along the two-track bordering the project site or on top of the hill near the house (two story brown sided home). Take the drive up to the top entrance for additional parking. Canyon Crest Estates: From Moscow, take Highway 95 South to Lewiston. After crossing the bridge over the Clearwater River. Turn left onto E. Main (before the light). Take a right on Lindsay Creek Road. Continue up Lindsay Creek Road for approximately 3 miles. Turn right into the Estates at Canyon Crest and park in the designated parking areas. the installation of 3,500 linear feet of riparian fencing. Four landowners in the Lindsay Creek watershed have participated in the project. In many locations within the Lindsay Creek watershed, livestock have access to the stream causing increased sediments, nutrients, and bacterial loading. The lack of riparian cover and water storage capacity reduces the ability of the riparian area to filter pollutants and slow water velocity. 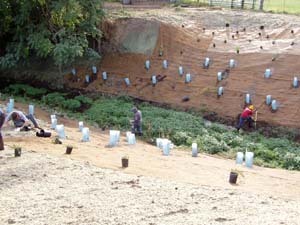 In addition to sediment, the Best Management Practices (BMP’s) established through this project will also be designed to reduce excessive nutrient and bacterial loading, to reduce water temperatures, and to improve riparian areas. 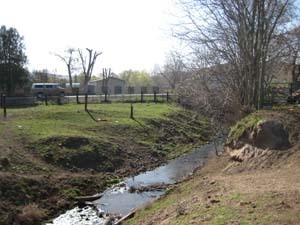 Pre-Restoration (April 2008): Steep, eroding banks and lack of native vegetation along the stream characterized this reach of Lindsay Creek. Pre-Restoration (July 2008): The lack of native vegetation and frequent soil disruption by livestock (buffalo and cattle) led to the invasion of noxious weeds. Modifying the current livestock management practices will significantly aid in the recovery of Lindsay Creek. 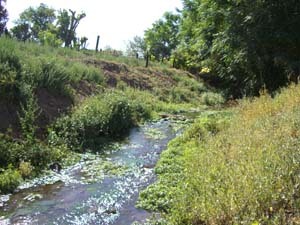 Pre-Restoration (July 2008): This photo illustrates the steep eroded steam banks clogged with invasive vegetation. Many bottles and cans were found on site. It is likely that the majority of the trash originated from a well-traveled road that bridges the creek. 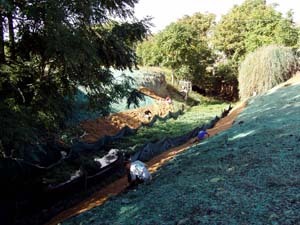 Excavation (October 2008): Both the north and south (shown here) banks were re-sloped to help stabilize the banks and remove weeds to provide suitable planting area to complete the re-vegetation of the stream banks. 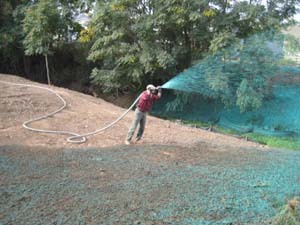 Hydro-mulching (October 2008): A hydro-mulch mixture of native and restorative grasses was sprayed throughout the site on all exposed soil. The hydro-mulched grasses help stabilize the banks and out-compete invasive species. Erosion Control Fabric (October 2008): With the help of several student volunteers, over 300 feet of erosion control fabric was installed on steep stream banks to support native plant growth, protect the newly seeded native grasses, and reduce erosion. The fabric (composed of hemp fiber and coconut husk) will biodegrade over the course of several seasons. Lindsay Creek Volunteer Work Day (October 2008): Over 200 native trees and shrubs along with 1,000 wetland sedge and rush plugs were planted thanks to the effort of several Washington State University students, community volunteers and PCEI’s own AmeriCorps members! Improved Gutter System (October 2008): A new gutter system was installed to redirect rainwater from the barn roof to an outflow pipe which drains directly into Lindsay Creek. The new gutter and pipe system prevents rainwater from running off the barn roof onto the steep banks and through the buffalo pasture reducing erosion, nutrients and bacteria entering Lindsay Creek. 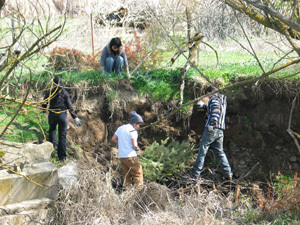 Brush Revetment Installation (March 2010): Volunteers working on a brush revetment on the Cowger property during a Saturday Restoration Event. 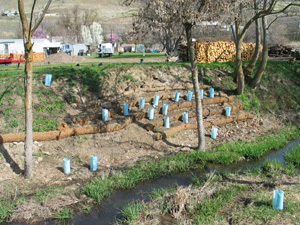 Bank Stabilization (March 2010): Waddle installation on Cowger property for bank stabilization and erosion control. 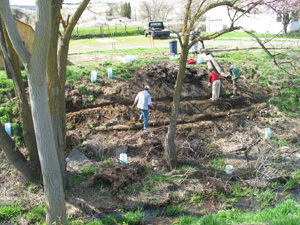 Later, plants are planted along newly restored banks. 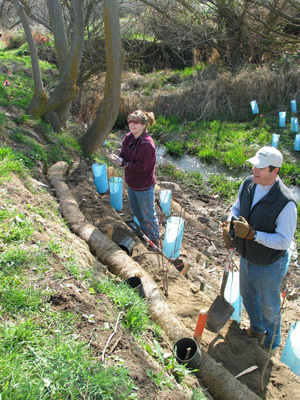 Planting after Erosion Control (March 2010): Two volunteers planting native trees on newly stabilized banks between the waddles. Post Erosion Control (March 2010): The end product after waddles and coirs have been placed in bank for stabilization and blue tubes set over the new plants for protection during Saturday Restoration Event. 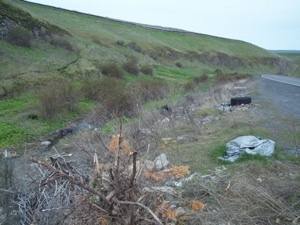 Canyon Crest Estate Project Site (April 2011): Trash accumulates on the banks of Lindsay Creek along our project site. Restoration designs will include a series of in-channel wetlands to help reduce nitrogen levels in the creek. Weeds! 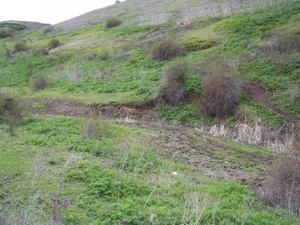 (April 2011):Weeds are the dominant plant on the Canyon Crest Estate project site. Poison hemlock rosettes are the bright green plant in the photo. Historically the property was grazed by cattle. 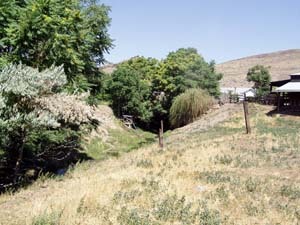 Horses are the only livestock that still have access to the creek. 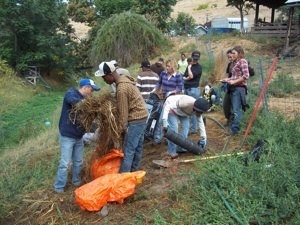 International Students Help Clean Site (October 2011): A group of Scholarships for Education & Economic Development (SEED) Program students from Central America, South American and the Caribbean help prep the Walton site for hydro-seeding and the installation of the temporary irrigation system. 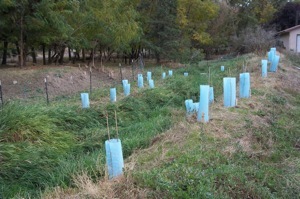 Neilson Project Site (October 2011): Native trees and shrubs were planted along Lindsay Creek. Weed control has been an ongoing challenge on all of our sites along Lindsay Creek. Poison hemlock and scotch thistle are the dominant weed on site. 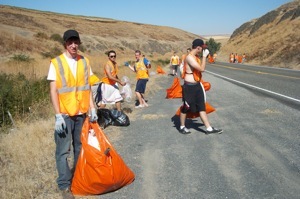 Trash Cleanup Along Lindsay Creek Road (October 2011): University of Idaho fraternity cleans the piles of trash and debris that litter Lindsay Creek road. 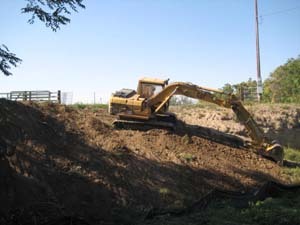 Canyon Crest Estates, a PCEI restoration project, borders Lindsay Creek Road.